Although all other users can reuse databases in their guides, they cannot add or edit them. Note: it is possible to create new vendors while adding databases, as well. By setting these up in advance, you won't have to worry about backtracking to add subjects, database types, etc. to your existing databases. 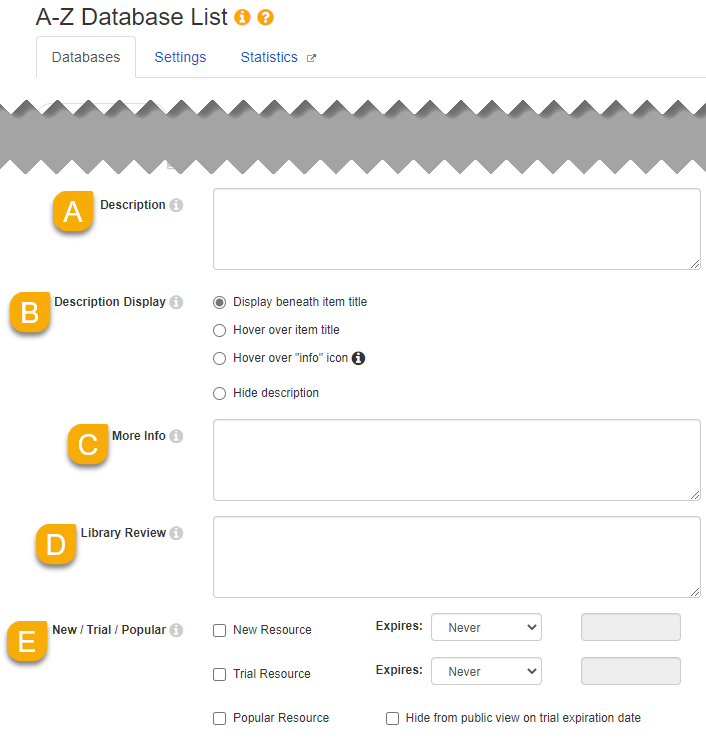 Go to Content > A-Z Database List. General database information: Vendor/Provider; Database Types; Database Name; and Alternative Name(s) & Keywords. Linking to the database: Database URL; Use Proxy; Window Target; and Friendly URL. Subject categories: Best Bets and Additional Subjects. Database descriptions: Description; Description Display; More Info; Library Review; and New/Trial/Popular. Management options: Permitted Uses; Hidden; Internal Note; and Owner. Select the Vendor / Provider for your database. If you've not yet added the vendor, select the Add New​ option to create it on the fly. Select the appropriate Database Types for this database. In order to assign a type, you must first add it under the Settings tab. If you have LibGuides CMS, you can click on the Community button to look for similar titles in the LibGuides A-Z Community. If there's a match, you can link to that database and reuse the vendor, database name, and/or description in your local asset. By linking your database, this will also allow you to analyze and compare your holdings with the rest of the Community. Enter any Alternative Name(s) & Keywords that apply to the database. These can aid in searching for the database and will display on the public A-Z Database List page. This can be helpful if a database is referred to by different names or abbreviations. You may also find it helpful to assign individual keywords so the database is more likely to be listed when users search for specific terms. In the Database URL field, enter the full URL of the database. If you use a proxy server that prepends your proxy URL to the database URL (like EZProxy), we do not recommend including your proxy URL in the Database URL field. Instead, add your proxy URL to your LibGuides System Settings (under Proxy & Library Systems). Then set the Use Proxy option to Yes in your database. If you use a proxy such as WAM, where the proxy address is included inside the database URL, then the Use Proxy option will not work for you. In that case, you will want to use the proxied URL in the Database URL field. If proxy authentication is required to view the database, set the Use Proxy setting to Yes. When enabled, LibGuides will automatically prepend your proxy URL to the link URL. Note: this requires your Admin to provide your library's proxy URL in your LibGuides system settings. From the Window Target dropdown, select whether to open the database in a new window, the current window, or whatever the current system default window target is set to (under Admin > System Settings). You can optionally give your database a Friendly URL. Because some database URLs can be lengthy, this gives you the ability to create a shortened URL that you can more easily share and bookmark. It also serves as a stable URL, as well. Even if you need to update the database's URL in the future, the same friendly URL can be used to access it. Friendly URLs can contain letters, numbers, underscores, and hyphens. For best results, we recommend using lowercase letters. You can optionally assign your database as a Best Bet for one or more subjects. When a user filters your A-Z List by this subject, the assigned Best Bets will be highlighted at the top of the list. You can also assign this database to Additional Subjects. When a user filters your A-Z List by these subjects, the database will be listed below any assigned Best Bets. In the Description field, you can enter a public description for this database. Use the Description Display options to customize how the description displays in the A-Z Database List (and when the database is reused in guides). Display beneath item title: this will display the full text of the description on the page, right below the title. Hover over item title: this will display the description in a popover when a user hovers over the title. Hover over "info" icon: an info () icon will appear next to the title. When a user hovers over it, a popover will appear displaying the description. Hide description: if you would like to hide the description, select this option. This will not hide the More Info field. You can also enter additional details about the database in the More Info field. Users will see a More Info link appear below the description. When a user clicks the link, the text from the More Info field will expand onto the page. You can optionally add a Library Review of this database to share with patrons and the LibGuides community. This can help you share a more subjective review of the database with your patrons, in addition to the database's overall description. 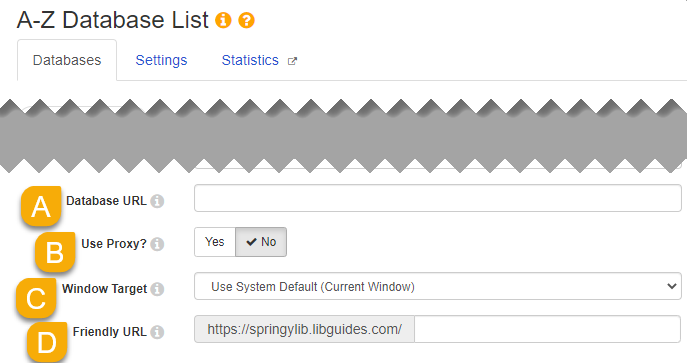 Library reviews will also display when looking up a database in the LibGuides A-Z Community. This is a great way to share your experience and critically evaluate new resources! 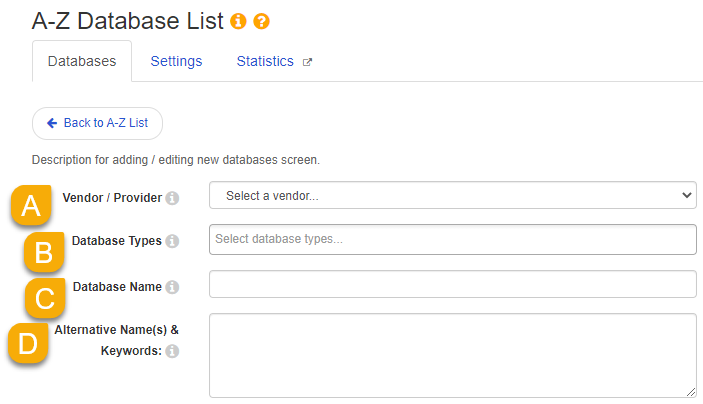 Use the New / Trial / Popular options to flag a database as a new arrival, a trial subscription, and/or a popular resource. The New and Trial statuses can be set to expire on a certain date. Use the Expires options for each to set the expiration date. New - these are new databases that you've subscribed to. Choosing this status can increase awareness of your new resources, as it will automatically appear in the New / Trial Databases box on the public A-Z Database List. Trial - these are databases that you are currently trialing. Choosing this status can help encourage your patrons to try it out, as it will automatically appear in the New / Trial Databases box on the public A-Z Database List. If an Expires date is also set, the database will automatically be set to Hidden once the date passes. This will hide it from all public pages. Popular - these are your most popular databases. Choosing this status can make it easier for your patrons to find these, as it will automatically appear in the Popular Databases box on the public A-Z Database List. Select the Permitted Uses for this database. This makes it easy to manage your license permissions for each database. These will display in your A-Z Database List so you can easily look up a database's permissions. 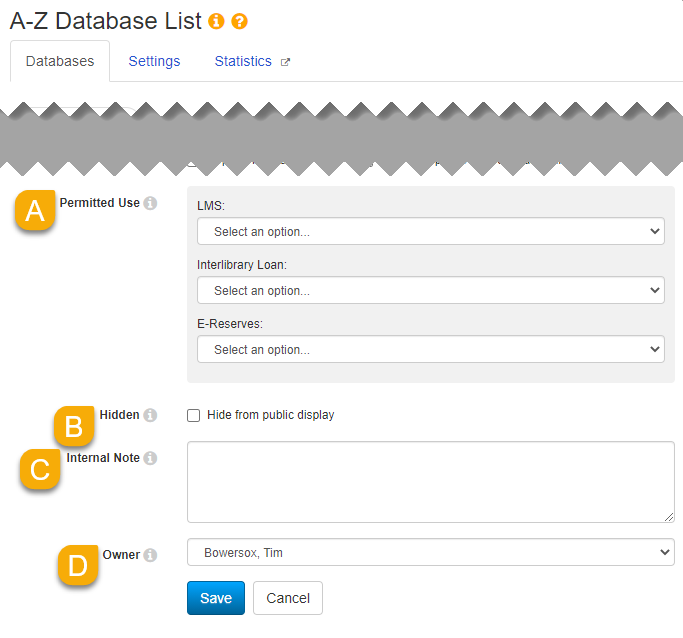 Select the Hidden option to prevent the database from displaying on your public A-Z Database List. This option is handy if your trial ends, or you cancel a subscription, but want to retain the database information in case you subscribe in the future. You can use the Internal Note field to store important info about the database, such as expiration dates, vendor contact info, or login information. These notes do not appear on the public A-Z list. Use the Owner dropdown to assign ownership of the database to someone else. Optionally, you can assign resource icons to your link. Click on the Assign Resource Icons panel to select the icons to use. Optionally, you can display a thumbnail image (such as a logo) next to your link. Click on the Assign Thumbnail Image, then click the Browse button to upload or select an image from your Image Manager library. Note: thumbnails only display when reusing a database in a guide. They will not display on the public A-Z Database List page. For best results, use a consistent size for all of your thumbnails. 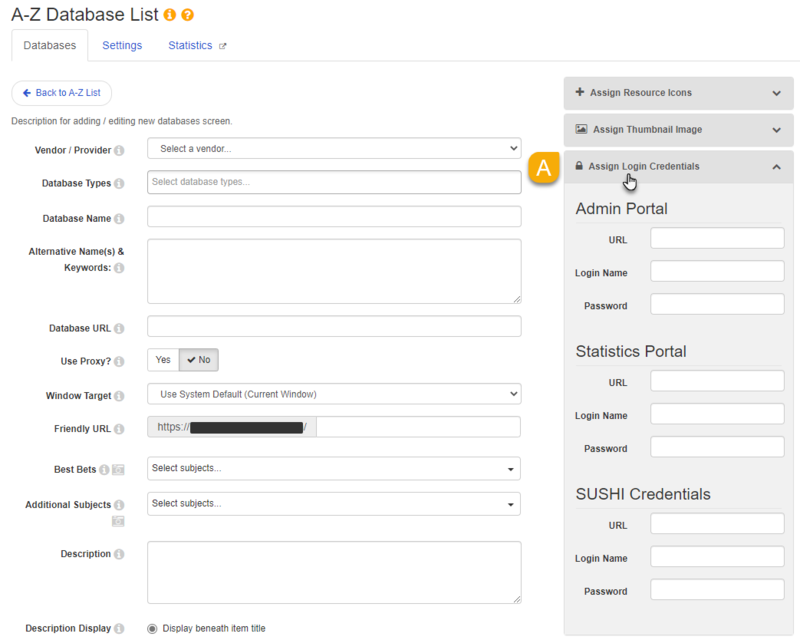 Optionally, you can use the Assign Login Credentials panel to store the various login credentials for each database. This can help you more easily organize and manage the login information for your databases, such as admin logins, stats logins, etc. The types of credentials you can store can be managed in your Login Credential Type settings (under the Settings tab). For each credential type, enter the corresponding URL. For example, if you're storing admin credentials, you can enter the URL to the admin login page. Enter your credentials in the Login Name and Password fields. Click the Save button at the bottom of the page to add your new database. Although it will appear immediately in your A-Z Database List, please allow up to 15 minutes for it to appear in your public search results. What is the A-Z Database List?